A ‘short tail’ evolution of the original Porsche 917 racing car, the Porsche 917K took to race tracks in 1970 to much success. Now, many years on, one of these incredibly exciting racing cars has sold at auction for over £10million. Dominating at Le Mans in both 1970 and 1971, the 917K featured a 5.0-litre flat-12 engine that produced a maximum of 630bhp. Unlike the original 917, which had been noted by the drivers to be a handful at high speeds, the 917K (Kurzheck or ‘short tail’) featured a less upswept tail and vertical fins to assist with aerodynamic performance and high speed stability. 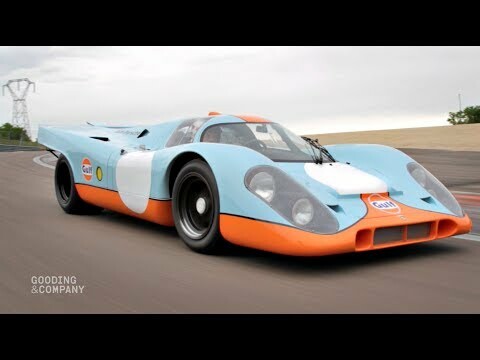 In fact, the 917K was so stable that the drivers noted they would be confident enough to entirely remove their hands from the wheel at speeds above 200mph. Auctioned at the illustrious Pebble Beach Auctions earlier this year, this particular Porsche 917K – chassis 917-024 - was originally used during testing at Le Mans in 1970; a testing at which it set the fastest times with Brian Redman at the wheel. Continuing to set fast testing times, 917-024 then went on to test at circuits such as the Nurburgring, Le Mans and Ehra Lessien. After its very successful career in the world of motorsport, it was sold to Porsche factory driver and Formula One driver Jo Siffert. Remaining in Siffert’s care until his unfortunate death, this 917K was even leased out to Steve McQueen to feature as the star of the 1971 film ‘Le Mans’ – a film that undoubtedly shot the Porsche 917K to stardom. A very important part of Siffert’s life, 917-024’s final farewell to the legendary driver was to lead his funeral procession before being sold to a private collector in Paris in the mid-1970s. Following this sale, 917-024 disappeared for almost 25 years, eventually being found in a warehouse in 2001. Following being found, 917-024 was subject to a full restoration with specialists Graber Sportgarage in Switzerland before heading to the Pebble Beach Auctions in 2017. An important car in Porsche’s motorsport history, this 917K headed to the California based auction wearing the description of ‘one of the most correct and significant 917s in existence and easily one of the finest racing cars to come to public auction’ - a trait that was definitely reflected by its winning auction price of $14,080,000 (£10,421,909).